Prepare the jelly as per the instruction on its package. When it cools a little pour spoonful of it in small bowls/servers and leave it to set. Meanwhile grate the apple and banana and finely chop the grapes. Alternatively chop all fruits together in an electric chopper. In a large bowl take the cream, add sugar in it and whisk it well. Add chopped fruits and mix well. 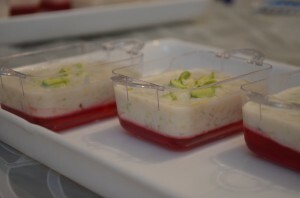 Once the jelly sets, put spoonful of fruit cream mixture in each bowl over the jelly. 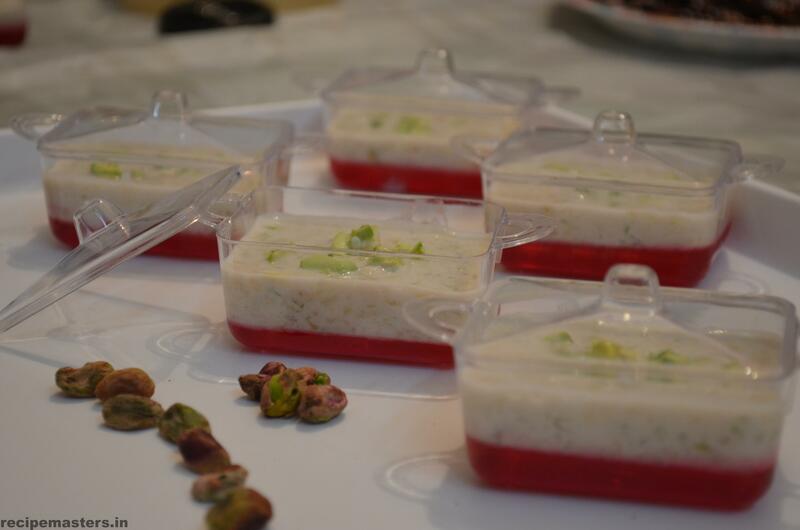 Garnish with some chopped pistachios. Refrigerate it for 1-2 hours. Serve chilled. *You can use fruits of your choice like mangoes, kiwis, strawberries etc. Those containers are awesome!!! Dessert looks yummy! !